Love the fresh flowers of springtime? Bring them inside by ordering a spring flower arrangement from SAIA FLORIST, your local Greenville flower shop. You will love gazing at your beautiful blooms all week long. Know someone who needs a little appreciation? 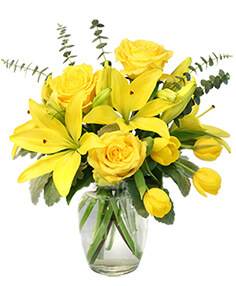 Send spring flowers to lift their spirits, no matter if they live next door or across the country, SAIA FLORIST can help! SAIA FLORIST creates a tantalizing, seasonal potpourri of warm fall colors with their vibrant, fall flower designs. Select an arrangement with glowing fall colors to illuminate your Greenville, MS home. Show a little affection with a floral bouquet of autumn flowers. If you're more daring, be a little flirtatious with a fall vase arrangement filled with copper, saffron and pomegranate colored flowers. The expressions of fall can be found everywhere in Greenville MS. Whether you want a homespun delight or a festive centerpiece, fall magic is always available at SAIA FLORIST.